The "American Zephyr" motorised bicycle gained early notoriety through its adoption by the rakish young men of New York high society in the 1860's. Although originally designed for "efficacious conveyance" through rough countryside, the Zephyr's stylish lines and raw power quickly saw it become the preferred mode of transport for eligible bachelors looking to project an attitude of youthful rebellion. Motorised bicycling became something of a sport for these young bucks, with illegal races regularly held on the deserted streets of Manhattan in the small hours after midnight. The New York Times was to write with dismay of "the interrupted sleep experienced by residents of Broadway as boorish young men engage in noisy transits of the thoroughfare astride these mechanical contraptions". So great did the nuisance become that the newly-formed New York Police Department was forced to introduce a late-night police patrol. Initially the patrolmen were mounted upon horses, but the noise of the bicycles proved too much for the poor beasts, often startling them into panicked bolting. 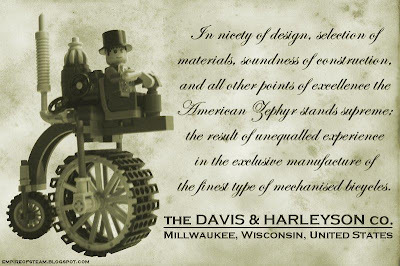 Embarassed by the poor press its products were receiving, the Davis & Harleyson company donated three Zephyr-model bicycles to the Department in an attempt to level the playing-field. This development saw the birth of what was to become known as a "Police Chase"; ever-after a staple of the more action-oriented cinematographs. The chases and subsequent arrests saw a number of the heirs of prominent New York families brought before the Courts for "the reckless endangerment of life and property through the inprudent operation of a vehicle". With a handful of embarassing convictions, the fad for illegal street racing died away amongst the idle rich, but the Zephyr's rebellious image was cemented in place and an American icon was born. The interested reader is invited to view further photographic images of the Zephyr here.